Yesterday dawned a slightly overcast but mild and calm day. Gord and I puttered around the house(me - the sewing room, him- the workshop) for a bit in the morning and then we packed some peanut butter and banana sandwiches and took them with us snowshoeing at the golf course. This was the view from the shelter where we sat to eat lunch. 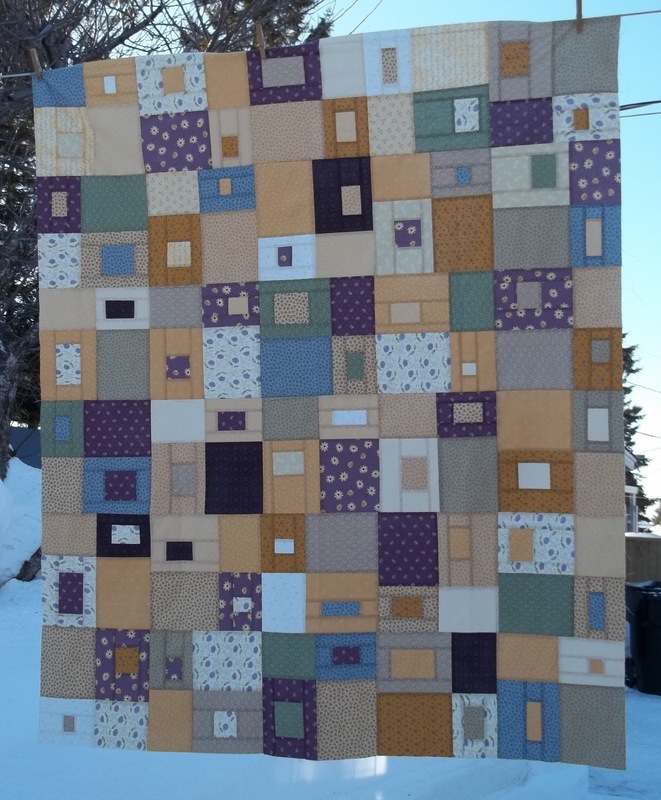 Just before leaving the house, I put the last seam on the quilt, so I took the time to hang it outside from the clothesline and take a picture. The neutral bits are still showing up as more beige than gold even in this close up view. I really like this pattern that I took from the book Color Shuffle. I love all the asymmetrical rectangles. Right now it measures about 52 by 62 inches. Once I add the borders, it should be around 64 by 74 inches. These little birds were at my feeder at breakfast time this morning. 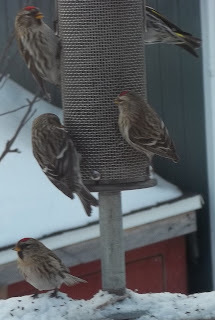 I believe they are redpolls. On Thursday I had my colonoscopy, and yesterday was lunch and errand day so I haven't done much. This was my fourth time for the colonoscopy and it really does get easier. I go into the cleanse with a positive attitude. I followed some suggestions I found on the net -- get comfortable. I put on my pajamas when I started drinking, I lit candles in the bathroom, and I used a lubricant to help prevent soreness later. I 've learned to chug like I never could in university! I also started early in the afternoon so I was done by early evening and I got a good night's rest. The whole procedure went well except that they found and removed 4 polyps this time. I was disappointed because, although I've had them before, I expected to be clean this time as last time. Now I'll have to go back sooner. Oh well at least I can have comfort knowing they were found and removed. I'm a real advocate for this procedure as I had 3 large pre cancerous polyps removed about 10 years ago. It's a much better alternative than coping with cancer. Now on to a little art postcard that I got inspired to start yesterday. I needed a break from the tedium of sewing blocks together. I thought it would be interesting to document my process. I pulled out a stash of scraps of fabric which I block printed or screen printed but have never used. It's funny, some don't appeal to me at all when I first do them. I simply put them away. I think it may be that it just doesn't match the vision that is percolating in my head at the time. The next step was to layer it on a stiff interfacing. 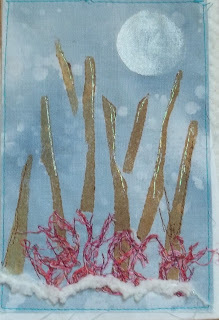 Then I used Setacolor opaque fabric paint to add the moon. I stitched the threads into bush shapes, added some snow and some hollow shimmer thread to one side of the trees. I usually have some sort of vision of what I want to do but it is usually a very intuitive process for me with each step being revealed as I work. I think my next step now will be to add some pink color to the sky with my Neo Color II crayons and do some more stitching on the trees. I've been researching for some time into buying a new and better camera. Because I recently lost my little camera that I like to take on my walks, I opted to buy another small mid range camera when my husband saw one advertised for less than half price. I picked it up this morning. I will still be saving for another bigger camera but this one seems perfect and has a lot more options and a much better zoom than than my old one. here is a picture of all my blocks up on the design wall. 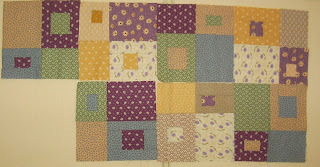 i have sewn the two top horizontal rows. i am still not getting the true colors in this quilt though. It really is pretty-- much more golden hued. 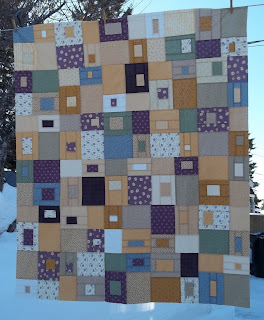 Once put together, I believe I will try hanging it outside on the line for a better picture. 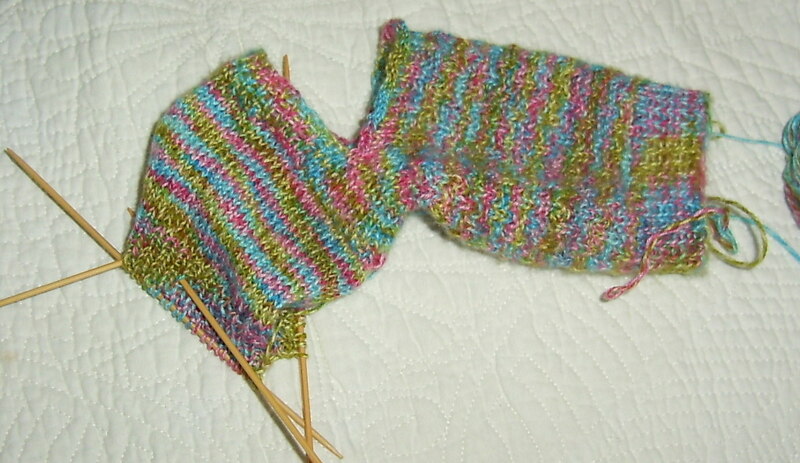 Next, I tried a close up of my latest knitting project--socks-- and the detail is great. 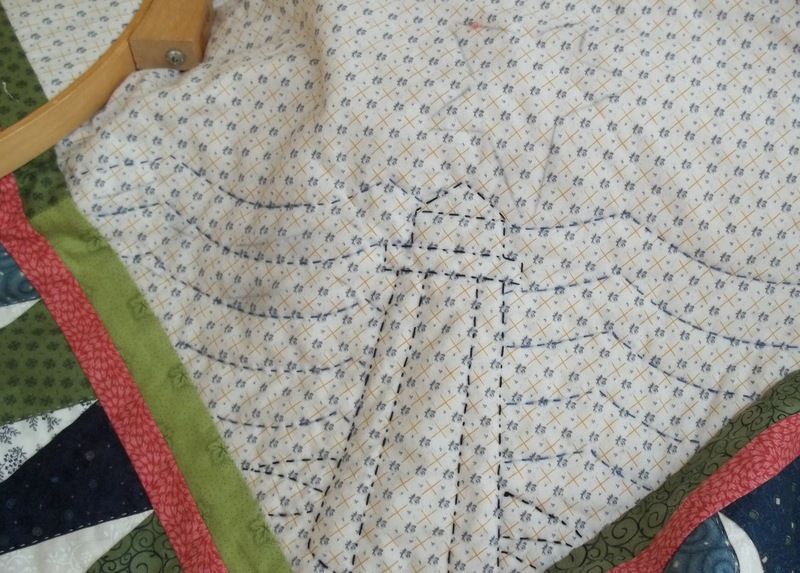 This is a close up of a section of my Mariner's Compass quilt where I traced a star on this morning. You can just barely see the star. 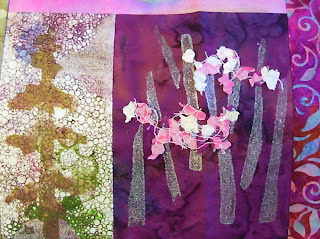 I am quilting part of the quilt with perle cotton (areas where there is no piecing) and part with regular quilting thread. 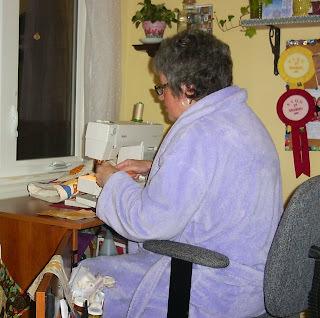 Now that I'm done playing with the new camera, I'm going to go do a little sewing and quilting. You may nit hear form me for a few days as tomorrow I'm doing the cleanse for my colonoscopy on Thursday morning. I'm not looking forward to it, but as I've done it 3 times before I know the routine. tomorrow will be the worst part, the test is easy. 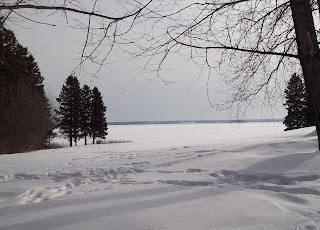 We got another big storm on Friday, and according to the weather channel that I watched last night we here in Bathurst got the most snow--about 25 cm. Then yesterday the cold front moved in. There were only 3 of us at the UFO day. It was very relaxing though. 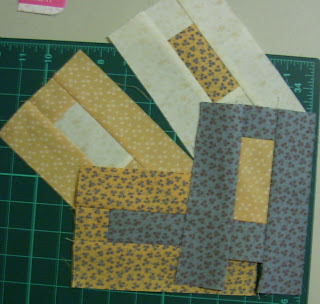 I took all of my quilt blocks except the last five and got them trimmed. That is the part I hate to do so it was nice to do it in company. I finished up this little pin cushion. The pattern came form Retro Mama. I love her style. Today I finished this hat for my husband from yarn left from my hat and the leg warmers I made. It fits really well. 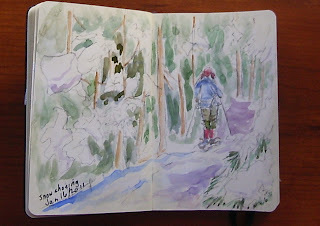 I haven't sewn anything yet today because we blazed the snowshoe trail this morning in the fresh snow. The temperature was -15 celsius but the trails are all in the woods sheltered from the wind. We were both quickly sweating. 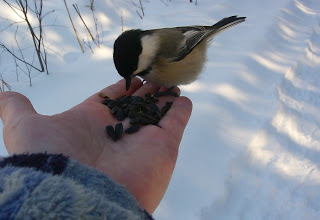 I did take the time to feed the chickadees but didn't take pictures as I figured it would be too cold for the camera. After that we visited the in laws for a while. I just made homemade pizza dough for vegetarian pizza and Gord is putting it together as I write. It's a recipe I've been using for years. 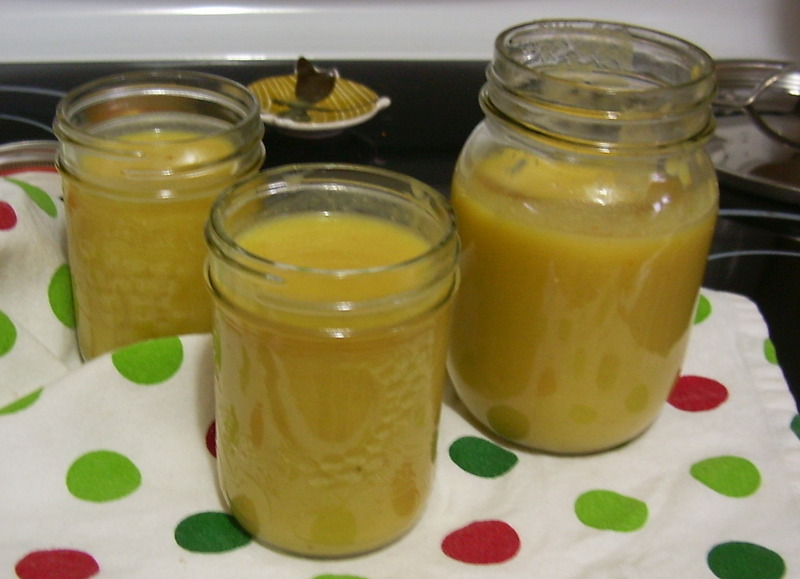 You dissolve 1 tbsp of yeast in 1/2 cup of warm water. Add that to 1and 1/2 cups flour ( I mix whole wheat and unbleached white) with 1 tbsp oil and knead for about 3 minutes until smooth. I put it in an oiled bowl in the oven with the light turned on for about 1/2 hour. It makes one 12 inch pizza. 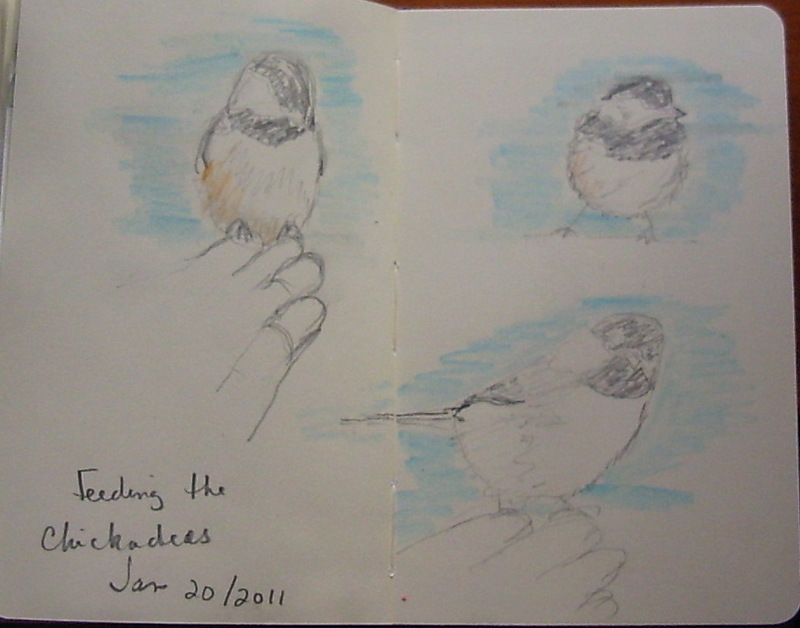 Finally, I added a little more color to my chickadees sketch but I can see that I could use lots more practice. It's funny how one day you wake up feeling terrible, depressed and sick and the next day you feel OK. Today was a good day, and I took advantage of the sun this morning. I went snowshoeing and fed the chickadees which is one of my happiest things to do in the world. Along the trail someone has put up some feeding stations and the chickadees will quite willingly feed from your hand as well. I stopped a few times to hand feed and take some pictures. 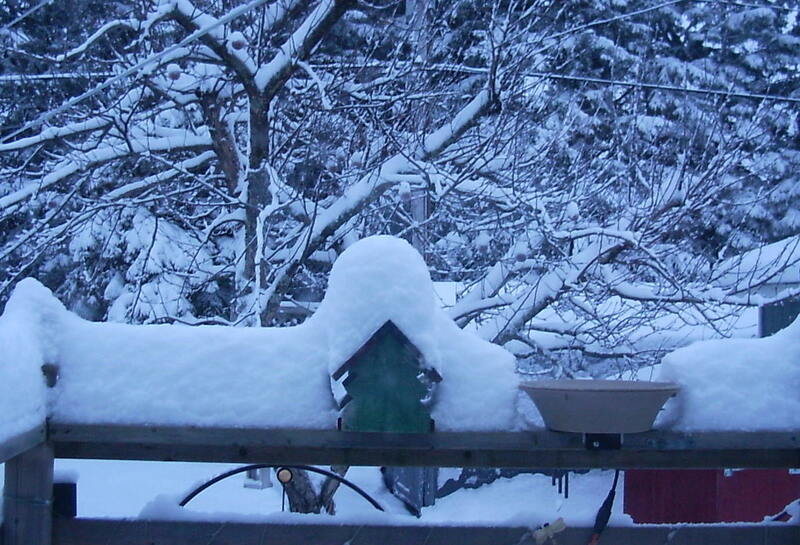 This is a picture of the snow in our backyard. The window at the end is my sewing room. 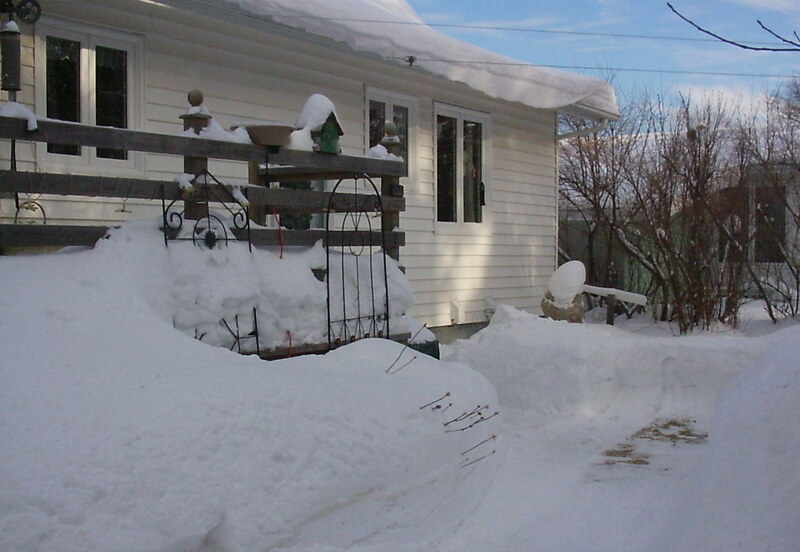 It is a good bit of snow but not nearly what we had a couple of years ago. 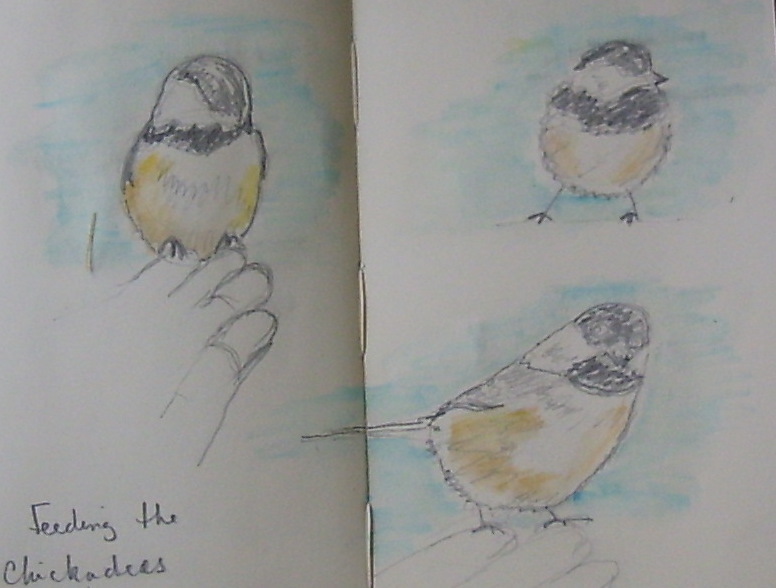 Once I got home, I was inspired to try quickly sketching a few chickadees. I started to add some color but I had to leave for my doctor's appointment. I will get back to tehm. School was canceled around most of the province today except for here. I think it should have been as we got more snow than anticipated. I used to love a good snow day when I was working because it meant a day 'cosied up' a t home. 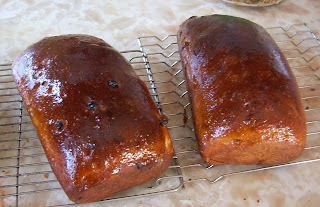 Often I would make bread or bake something that I normally wouldn't have time for. I still try to do the same thing. Wednesday is usually my morning for swimming but I just couldn't get myself out to clean off the car. I don't have far to go so it would have been OK driving, but I was dragging again this morning. I feel like I had to physically pull myself up out of an aching lethargy of lassitude and depression. It was one one of those mornings and I don't know why they hit. I finished my antibiotics and was feeling better. I have a doctor's appointment tomorrow though. Finally around 10:30 I got dressed and did the 3 mile walk on my exercise video. That lifted my spirits. 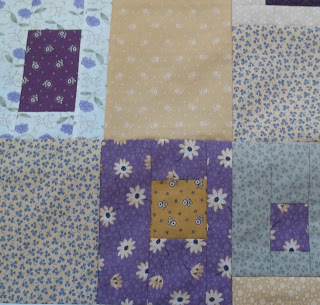 Then I got this crazy patch block done for a group quilt our guild is doing. These are my favorite colors right now. 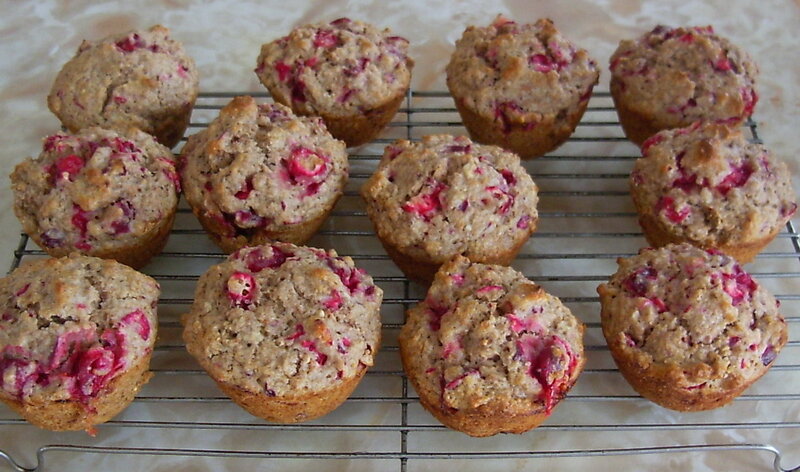 After lunch I was feeling increasingly bad, aching all over, so I took a Tylenol and made these muffins. It doesn't do for me to nap; usually, I just feel worse. 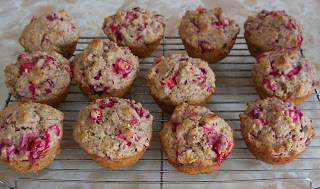 These are Cranberry granola muffins, made from one of my 'go to' recipes. I took it from a newspaper so I should be able to add it here. Add the wet ingredients to the dry ingredients and mix just until blended. Bake at 375F for 15 to 20 minutes. Makes 12 muffins. The original recipe called for rhubarb. I use whatever fruit that I have available. 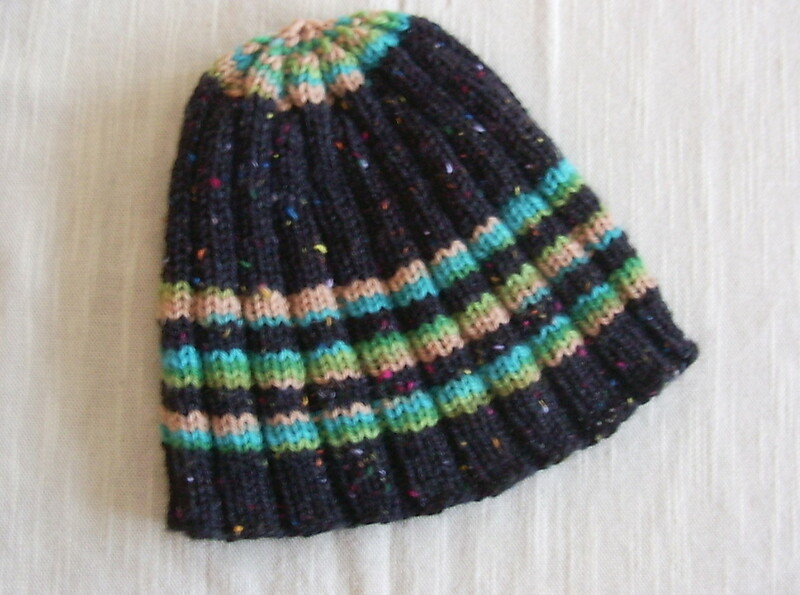 I was then able to take a nice break with a cup of tea and a muffin while I stitched a fleece band into the hat I just finished knitting. so, it took some effort, but at least I'm now satisfied with my day. You just can't ignore a day up here in northern New Brunswick in January when the sun shines. You must get outside to catch what few rays you can; even if it is only your face (I where something over my mouth too) that is bare. 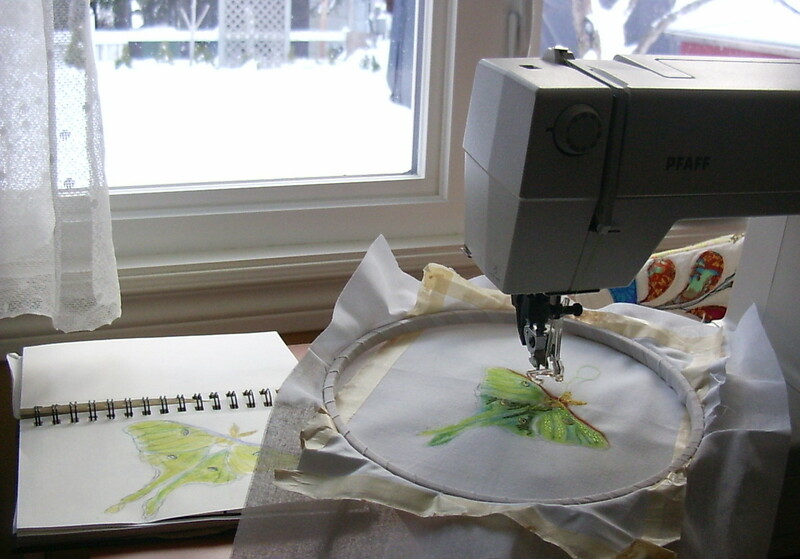 Gord and I had a leisurely Sunday breakfast as usual, and I did a little more free motion quilting. 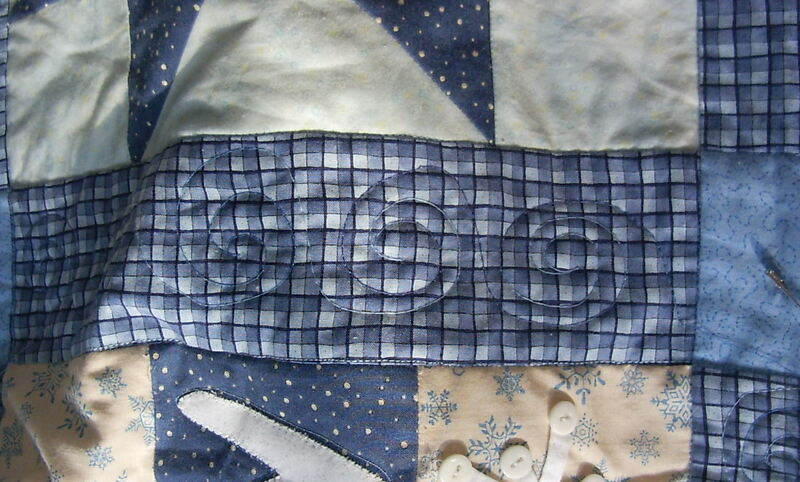 I finished this block this morning and I rather like the wind swirls that I added around the snowman. 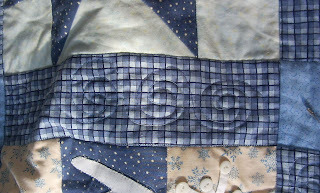 I've decided to use the same motif in the sashing as well. 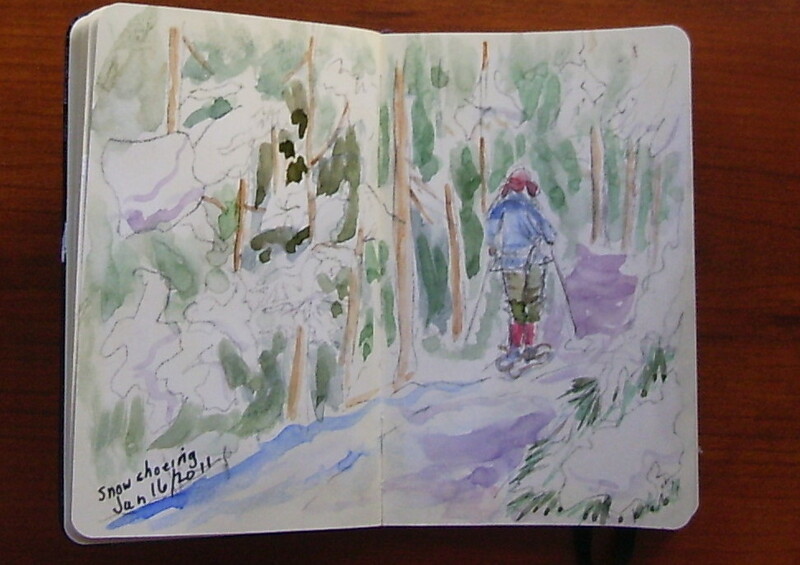 Around 11:30 we called some friends who met us at the trail and we went snowshoeing. I had planned to take my little sketchbook for some quick gestural sketches when we would stop for a break, but with company, I grabbed the camera instead. I seem to be always taking a picture of my husband as he walks away. He's just always in front of me. On the flat areas I catch up, but I slowly drop back like an old car that's lost it's power as we trek up the hills. Once home, we had a quick lunch and both took a little nap. I read for a bit and then came in here to look at my photos and do a quick sketch in my sketchbook. It is only about 3" by 5" in size and is meant for pencils, so I wondered what it would be like to add some gesso as a base since I often like to add a bit of watercolor to my drawings. Since it is meant for pencils or pen, the paper in this sketchbook is treated with a sizing that resists the watercolor. The gesso does help but it has a lot more tooth than a watercolor paper would have. Thus the watercolor doesn't spread. 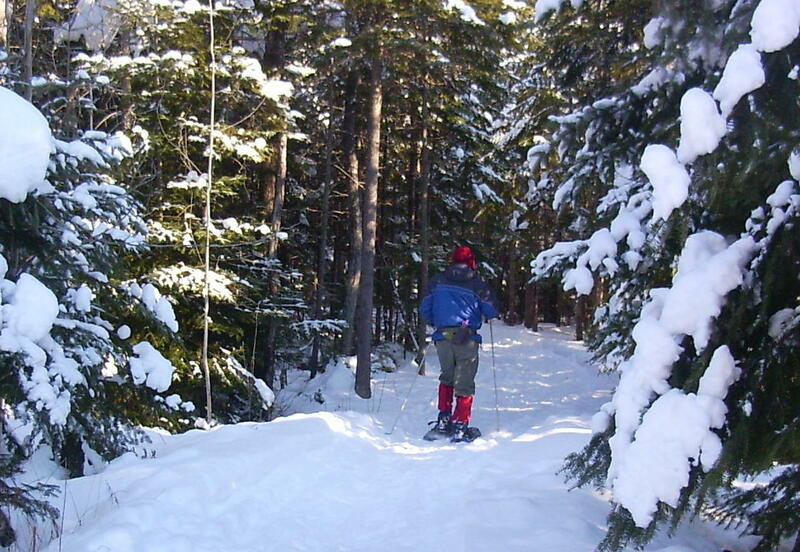 but we did not snowshoe because we just went last night after Gord came home from work.. There is something so magical about being out on a snowy trail in the moonlight. When Gord said he wanted to finish the baseboards in my sewing room today, I decided to make raisin bread and set my machine up in the kitchen. That was my inspiration to finally do some machine quilting on my Winter Quilt. I'm quilting each square separately and I'll do the sashing when the squares are done. It's really a little too high to be comfortable so I so it in small bits. It could be in my kitchen for a while. I have a Plexiglas table under there but I added a an 8" by 11" teflon sheet to it called the Supreme Glider which seems to be a lot more smooth. I noticed that they now make a bigger one and I believe I may order it. I could keep the smaller one to carry to workshops with my little Jem Gold machine. The quilt definitely moves a lot more smoothly. I would be a lot faster getting things done if I could just do one thing at a time, but that would just be boring!! Once the bread was done, we did go out for a little walk because it was so nice out. When I got back, I was so tired I stretched out on the sofa to finish this book, The Help. It was a really good book. 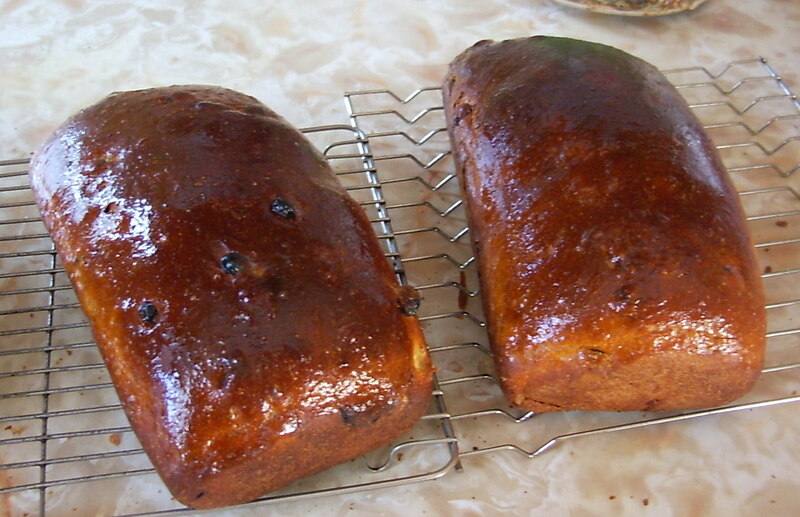 There is another loaf that I did not show athat we have already starte to eat. I could just sit and eat the whole thing! I always save my downtown errands for Friday when I meet some friends for lunch. I'm usually out for a good part of the day so I don't do much sewing. Yesterday, I had my 2 friends for the last drawing lesson. 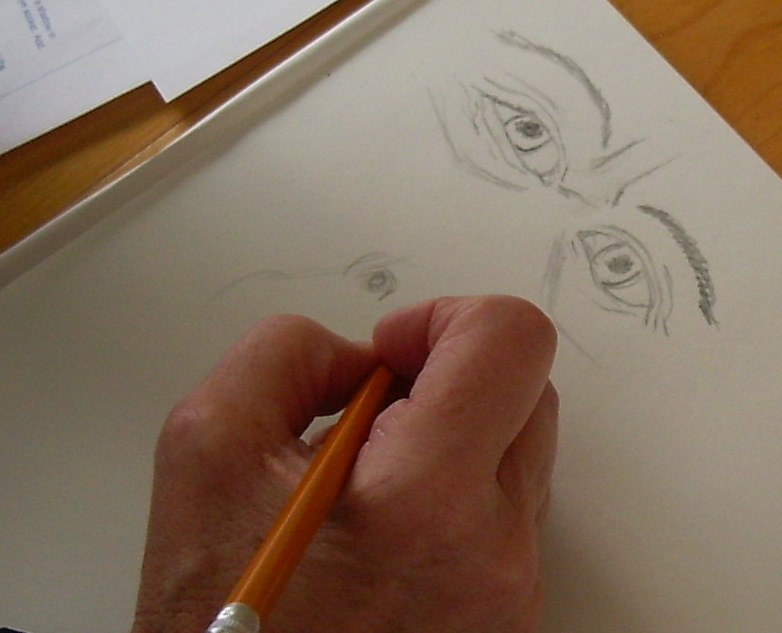 We did a bit on faces and gestural drawings of people. We did a mix of gestures and timed contour drawings of the face and eyes. I think they really enjoyed it. Isn't this expressive? Last night, I finished knitting a hat which I wore today and I bought a button to go on the band while I was out today. Also, I bought some fleece to go around the ear section to make it warmer. When I got home, I decided that I would like the band to be a little tighter so I tried to pull out the part where I had stitched it down and I pulled the wrong part and unraveled a section. 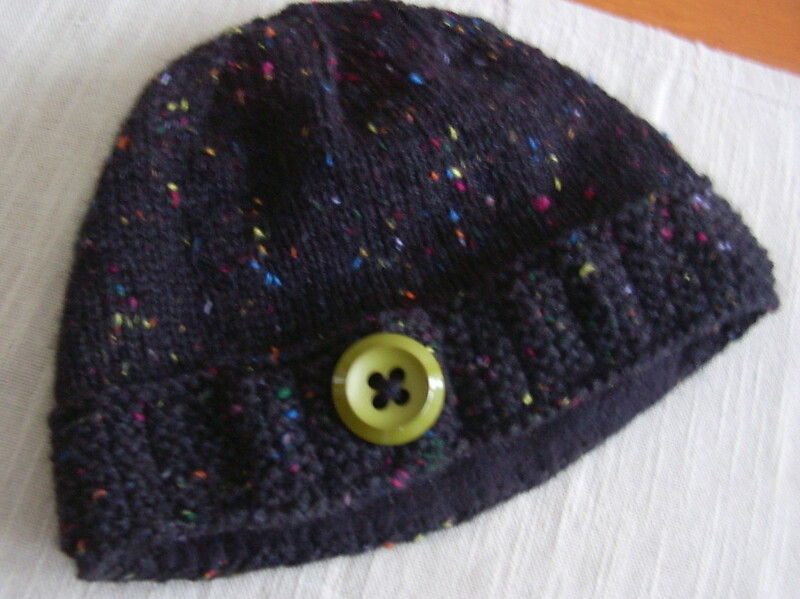 Now I've got to knit it again. I didn't even get a picture of it finished so I'll have to get one when I really finish it. Next, I decided to swallow my fear and attach the wire to my moth which was worse after what I did to the hat! Unfortunately the only color of wire that I have is a copper color and it did show up a little, but I went over the whole thing again and it seems pretty good. The detail in the picture is not as good as in the last post but you can get the idea. 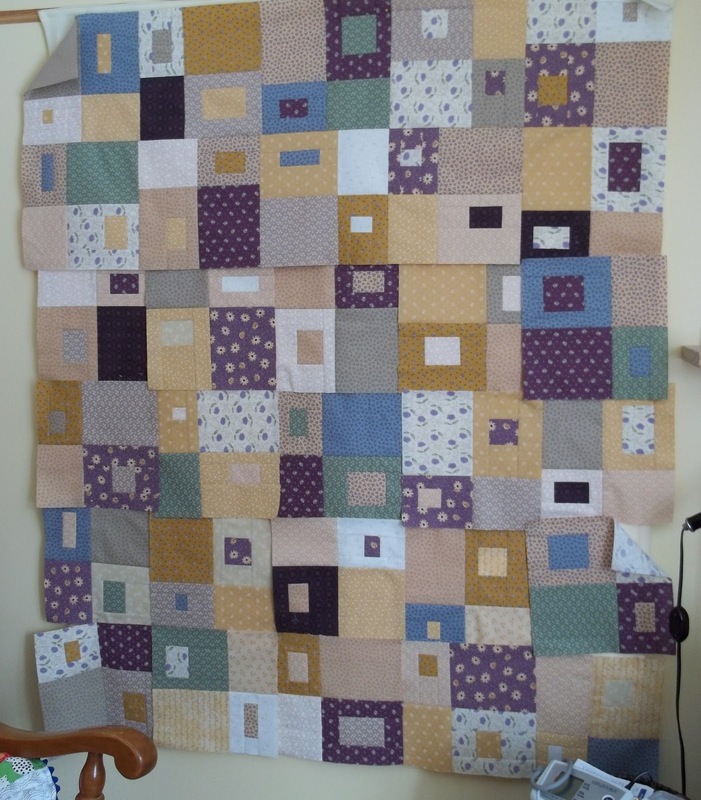 I've just got it pinned onto the top right now until I finish all the thread painting and get it ready to quilt. Oh and I almost forgot! 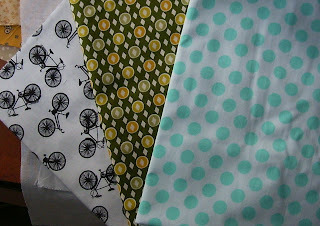 These fabrics were waiting for me in the mailbox today. They are from Pink Chalk Studio. I ordered them to go with another collection that I have. I'm very pleased with the quality. Again this morning I had to go out for an appointment and a couple of errands. 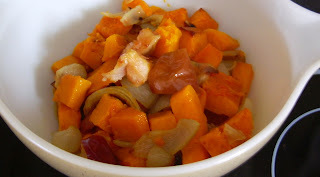 Before I left, I roasted some butternut squash, an onion, an apple and 2 garlic cloves in a 425F oven for 40 minutes. I set the timer for 10 minute intervals to stir. Shortly, I will add vegetable broth, some seasoning and blend it up. It is one of my favorite soups! I just spent the last hour or so adding some more thread painting to the moth. It is basically done, but I'm trying to decide it I want to try adding some wire to one side with a zigzag so I can make it dimensional with the wing slightly curled. Then I ironed the saran off the confetti leaves and cut some up to add to my hanging. I have to decide if I like them or not. This is one reason why I work so slowly. I hit a point where I'm not quite sure which direction I want to take an I have to let it rest. for today, I 'm going to call it quits, go get a snack and maybe do some knitting. Gord and I start back to yoga to-night at 5:45. 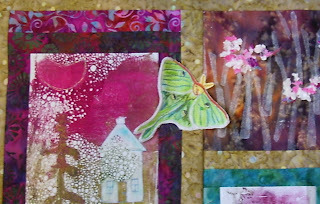 You might also notice a blog button on my sidebar for The Sketchbook Challenge . I don't like to take on too much in my already full schedule; however, it really does fit into my goals to spend more time sketching. I am keeping it small though. I did a little sketch around the January theme, Highly Prized, last night in my 3 1/2 by 5 1/2 inch Moleskine sketchbook. I discovered that the paper in this sketchbook doesn't really take watercolor. I will participate with the odd page if I can. The prescription bottle represents health, the antique nut grinder-- family and connections to the past, and the knitting stands for talents and hobbies. I feel very content today with the return of a little bit of creativeness. I had a doctor's appointment this morning and then had to go wait for a prescription so I didn't get to my sewing room until about 1:30. I needed to iron and hem pants for my husband before I could get to the fun stuff. Since I had to change the thread for that, I figured it was a good time to change over the machine to free motion mode. I only spent about a half hour or so on this, but it was enough to feel like I did something satisfying today. 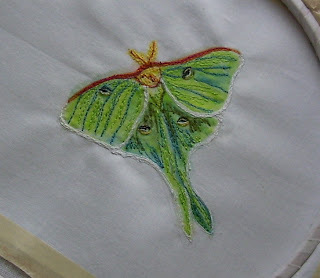 I put the first bit of thread onto my moth. In the fall I moved my machine in front of the window as in winter I'm searching for a much sun as I can get. Here is a bit of my view. Today a flock of gross beaks flew into the apple tree just outside the kitchen window. I was aching all over this afternoon, probably due to my infection, so finally by 3:30 I had a snack and took a Tylenol. I'm glad I did because it enabled me to go snow shoeing with Gord after he got home from work. We left at 4:45 and as we returned around 5:30, the moon and the first stars were out in the sky. It was beautiful! I had 2 posts in one day and then I've fallen off for 4 days! I can offer lots of excuses. I'm still dragging for one, and I don't want to be boring with the details, but I did get a call from my doctor who wants to see me tomorrow. It seems one of my tests results showed an infection. That could definitely explain my exhaustion. Then , I seem to have misplaced or lost the little camera that I like to drag around with me and have missed a few photo ops. Yesterday, I went to my first UFO day of the year. 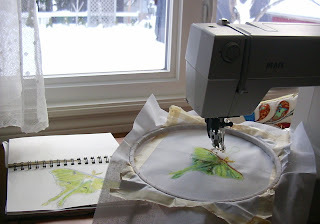 Since it was snowing, I didn't feel like hauling my sewing machine with all the paraphernalia. I took the bag from my closet with my Mariner's Compass quilt that I've been working to to finish hand quilting for a few winters. I do a bit in the winter and in the spring I stuff it away again. Here is one of the sections I worked on yesterday. 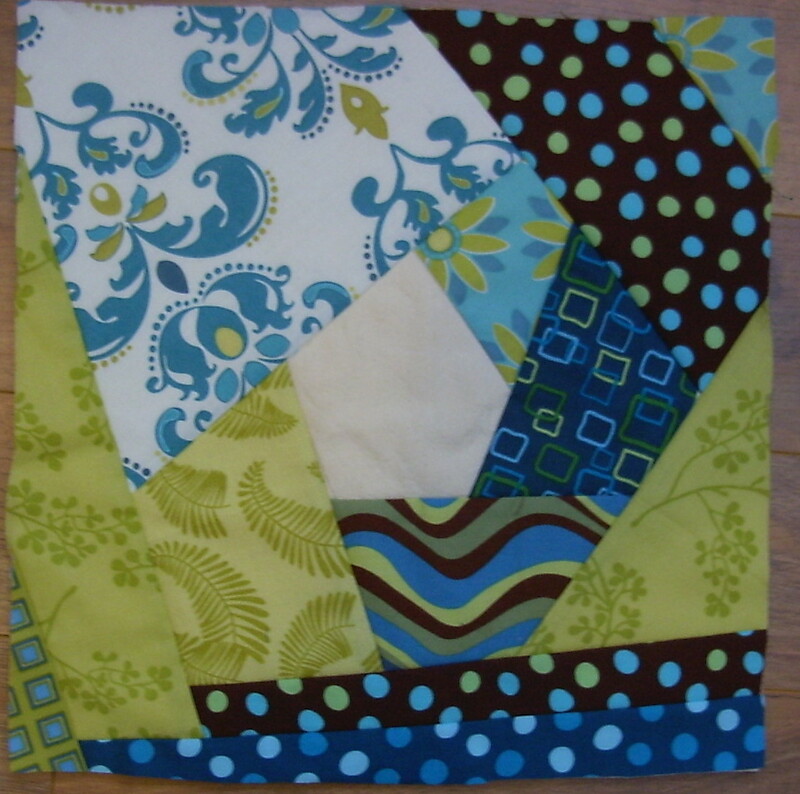 I'm using perle cotton to quilt the corner areas where there is only fabric with no piecing. This is what we woke up to yesterday morning as seen from my kitchen window. Today we had that much more again. It's been snowing since Friday night. 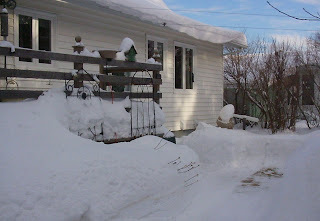 My husband is going out now to do some snow blowing and we may go for some snow shoeing a little later. 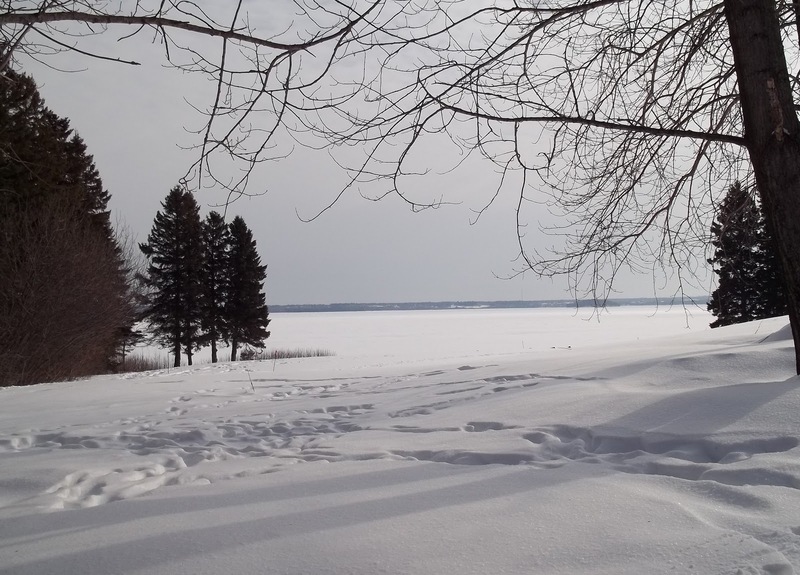 I find it quite difficult in fresh snow; however, I do feel the need for a little fresh air. 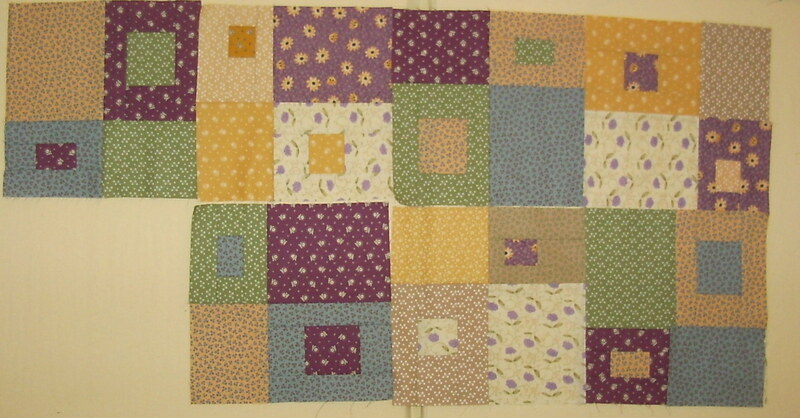 I worked again last night to do 4 more squares on this quilt. I cannot believe how much fabric there was in that kit just for a bag. I have enough made now to add another row which would make it 4 squares by 5 squares, but I also think I have enough fabric to do the 10 more squares required to go to 5 by 6 squares. I thought I was finished but I think I should try to use all the fabric so I may keep going. The picture really doesn't do the colors justice. While they're not really my colors, They are very pretty. The neutrals are really more golden and creamy. They show up very grayed even though I've photographed it at different times and in different lights. I probably won't get to any more today because my husband, Gord, may come back into my sewing room to work on the baseboards. 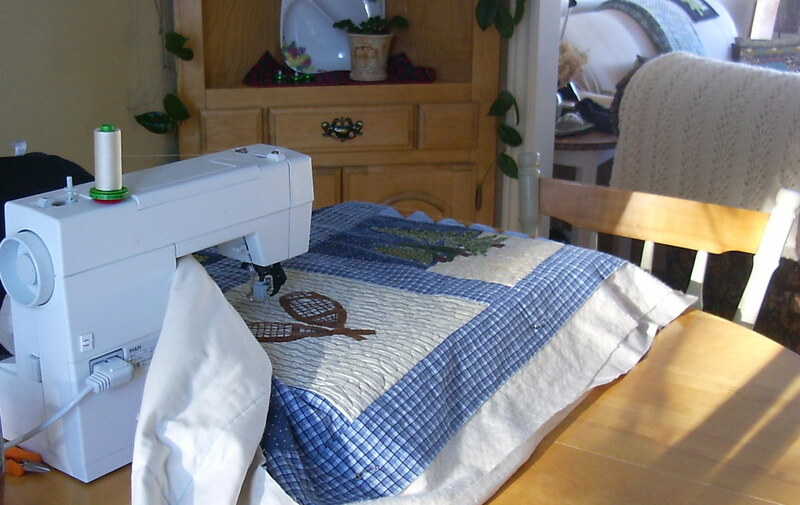 If that is the case, I may do more hand quilting or possibly move my machine to to the dining table to machine quilt another quilt that I have on the go. 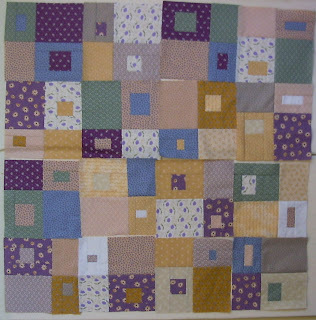 I've shown it before, and likely will again as I'm machine quilting each square separately. I never do these things all in one sitting either due to arthritis. I call it my Winter quilt. Each one of my friends did a block. These next few weeks are going to be very busy ones with lots of appointments and tests. Everything just seems to come at once. This week I have 2 doctor's appointments, a mammogram, physio, a hair cut and an appointment at the bank. The quilting girsl are also meeting and I have one last drawing lesson with my 2 friends. So those are my excuses for the next little while. There are some days when I get up and I just cannot clear my head nor get going. Today was one of those days. Usually a little exercise gets the metabolism going and I can shake it off, but nit today even after I went for a gentle swim and sauna at the spa. The good news is that the back is better. I came home from the spa and had lunch. When I still felt the same after that, I gave up and took to the sofa with my knitting and a book. This is why I feel quite good to say that I put together these 4 little blocks to-night that eventually will become a quarter of the larger block. I feel like i did something today! I have not often strip pieced such small pieces together and I'm finding that the ends of the seams are often ending narrower than the rest. Sometimes I have to flip it around and resew the end of the seam form the other direction to make it straight. Has anyone had this problem and if so, are there any suggestions? I'm going now to put my jammies on and see what I can find to watch while I knit. I didn't touch my sewing machine today. I met friends for coffee/tea and did a few errands. My back is improving although I still couldn't stand straight enough to go for a walk. Instead I put in a half hour on the indoor bike. 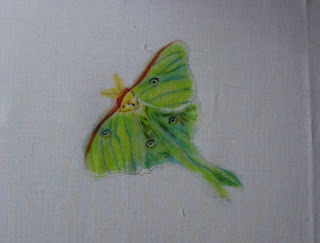 Besides that I had enough time to do a wash, make a vegetarian casserole and paint the moth onto fabric. 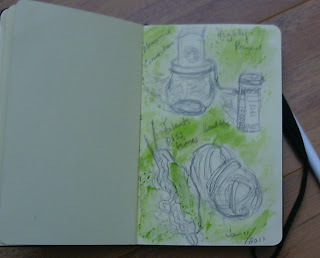 I opted for the heavier cotton and I did use the Derwent Inltense pencils. I really live the color, especially when you brush with it water. The colors come alive. I will be backing this with stabilizer to do some thread painting, so the blurriness and bleeding will either be cut away or covered by stitching. 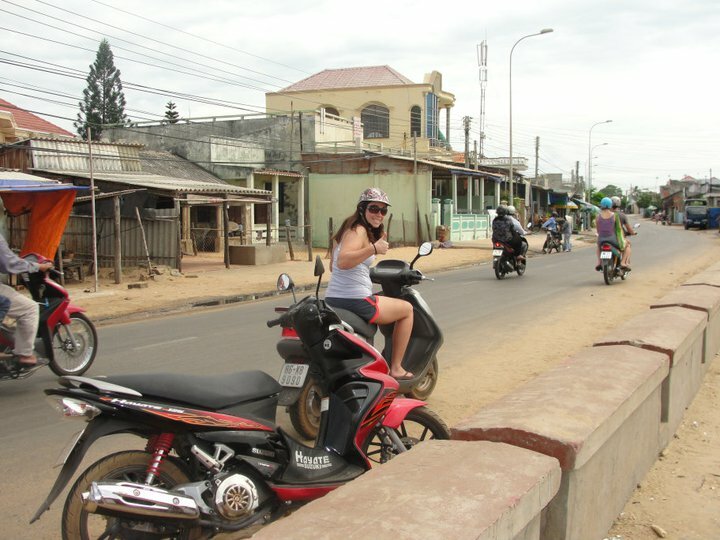 My daughter recently spent a week away from Korea where she is teaching to visit Vietnam over Christmas. 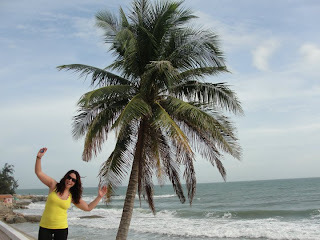 Her blog can be found in my sidebar. I thought I would share a couple of her photos. It has been quite an experience and eye opener for her to see how other people live. Wow! This is 2 posts in one day. It will be a short one this time. 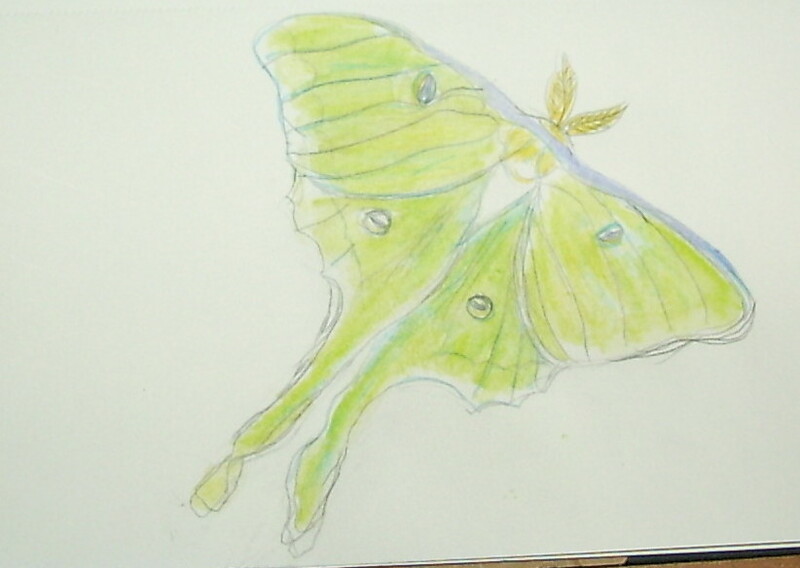 I did a very quick preliminary sketch of a luna moth just before supper with my watercolor pencils. It could use a little more detail but I will save that for the fabric. I've not done too many painted add-ons to a hanging other than dragonflies bees. Those I've done with needle lace on tulle. 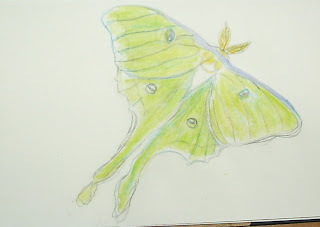 I plan to paint the moth but I'm not really sure what kind of fabric to use. I've traced it onto a cotton batiste to try with my Derwent Inktennse pencils. I guess if that doesn't work, I'll try a heavier cotton. I'm wondering if I should stitch a thin wire around the wings or not. 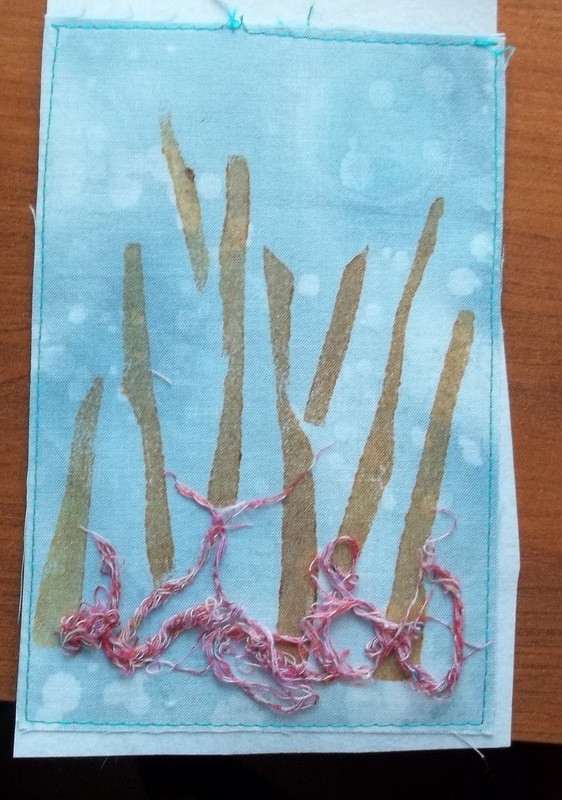 Perhaps some interfacing underneath before I thread paint would do the trick. We shall see. It has been some time since I worked on the mystic houses hanging. Once I finish the moth I will take it out and audition it on the hanging. My husband went back to work this morning in a snowstorm. While I'm happy to see some snow, I don't like it when he has to drive to work. So, I'm stuck in the house which I don't really mind. Monday is often my housework day, but I'm forcefully spared from that too. Yesterday, I pulled my back as I bent over to pick up something. I'm managing it with heat, ice and a few Tylenol back pain pills that I had in the house. They really do help take the edge off. This morning, I managed very slowly to change my bed but I can't vacuum. Oh darn! Yesterday, I was still able to make orange flax muffins and cauliflower curry soup using a heated belt that has a very long electrical cord. I'm able to maneuver all around the kitchen with it on. You can tell this hasn't been the first time I've done this. I must say though that it has been a couple of years. The yoga has really helped my back a lot. The soup was delicious and came from this magazine. I don't find it helps to lay down--the back just gets stiffer. 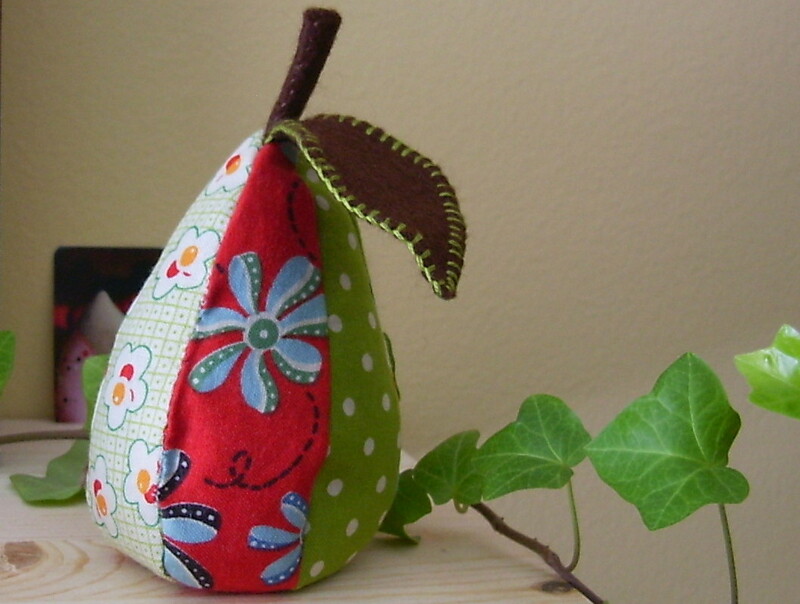 I'm able to do a little sewing in short periods. I've now got 3 rows of 4 blocks randomly put up on the wall. I'm still finding the color is a little off here, even though I tried taking the photo a few different ways. Perhaps next time if it's sunny out that will help. I'm going now to grab some lunch and perhaps I'll knit for a while this afternoon. 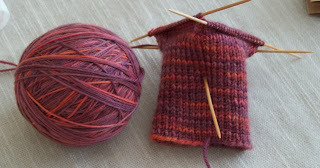 I'm making some yoga socks right now for myself. I gave the first pair that I made to the yoga teacher. They have no heels or toes. 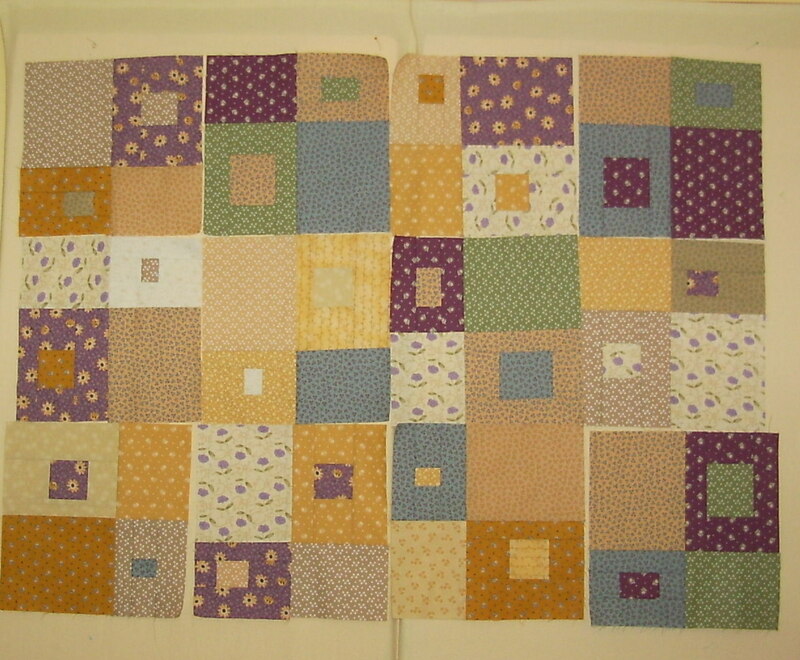 I have started a new quilt using a pattern form this book. The fabric kit for an appliqued tote bag was sent to me by my aunt last summer when I wasn't feeling well. It was so soft and pretty and there seemed to be such an ample amount that I thought it would make a lovely baby or lap quilt. These are the first pieces ready to sew. 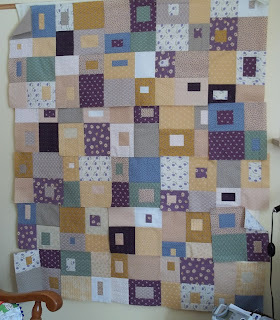 I have some blocks up on my design wall but it will be rearranged once I get more blocks done. The picture doesn't do it justice. I will try better for the next one. 1. exercise as much as I can to improve my health. My interest often tends to fluctuate between drawing, painting, art quilting and traditional quilting. I would like to continue to develop my 'voice' in art quilting but I also don't want to feel guilty when the urge hits to do some traditional piecing. It is very soothing and gratifying. I am not very good at measuring, cutting and planning, so it is often quite a challenge to figure it all out. 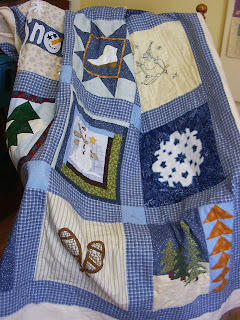 I am absorbed in this particular quilt right now and soon I will be working on my printed wall hanging again. 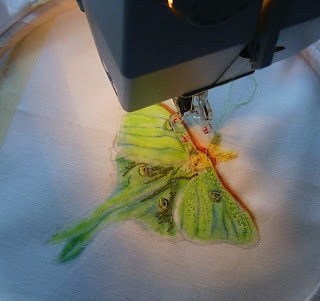 I'm thinking about painting a luna moth on fabric and the urge will hit me to do it one day. 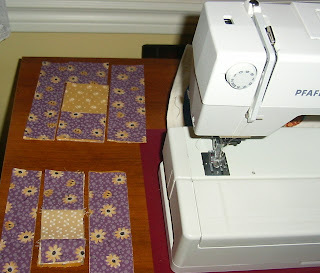 The only thing that I don't enjoy is the machine quilting. I have several that need to be done now. 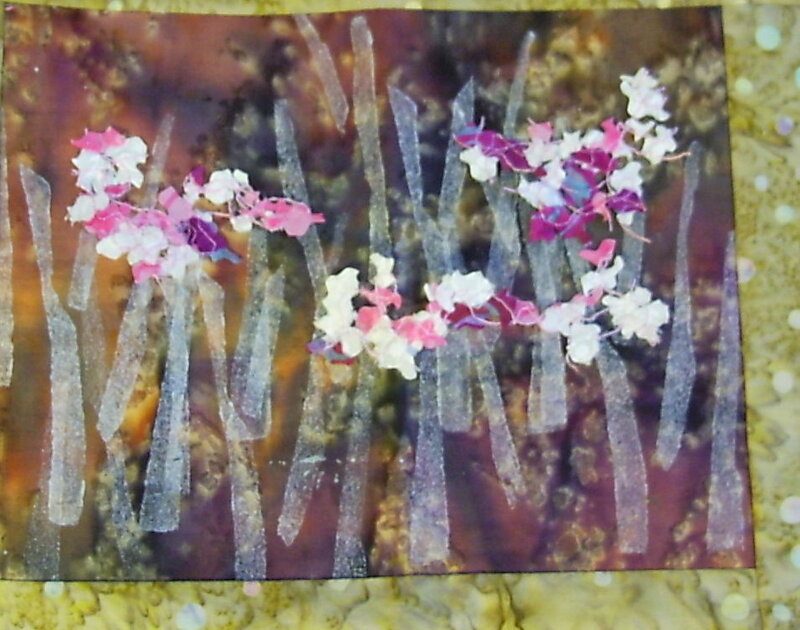 I can do the smaller ones myself but must wait until I can afford to send out the larger ones. I absolutely hate basting as well.